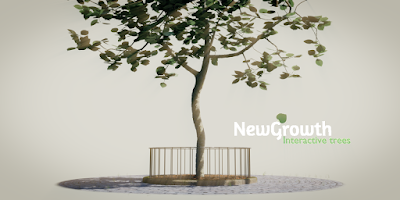 This article is the seventh intallment in a longer series on the development of a new tree add-on for Blender, based on the space colonization algorithm. The add-on is available on Github, and documentation on this page. Now that the addon is in Blender's Contrib repository I thought it was time to start acting on some of the feedback from the BlenderArtists thread. Previously the UV-maps that were generated for the leaves were rotated. Because most alpha mapped leaf image textures feature leaves with the tip at the top and the stem at the bottom this rotated arrangement was often counter intuitive. 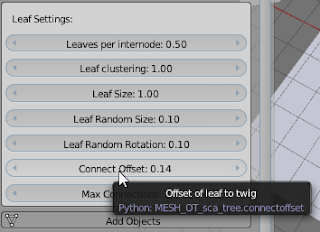 Depending on the image that you use as a leaf texture it might be useful to be able to control the point where the leaves are joined to the twig. This offset is now provided as an option slider in the leaves section. Note that even if this offset is zero the leaf plane might still be intersected by a twig. This happens when the branches are skinned with Blender's skin modifier (instead of the native skinning method).Before this skin modifier the addon adds a subsurface modifier which has the effect of cutting corners. Choosing a smaller internode distance and removing this subsurface modifier will prevent this unwanted intersection but in most cases (I.e. with enough leaves) this probably won't be noticeable anyway.